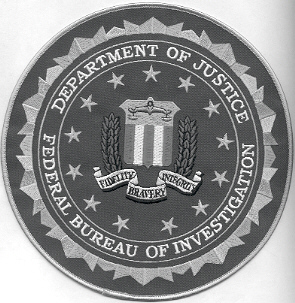 Each symbol and color in the FBI Seal has special significance. 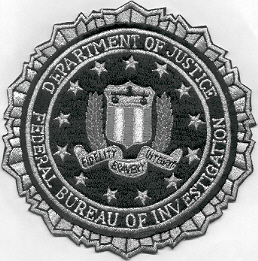 The dominant blue field of the seal and the scales on the shield represent justice. The endless circle of 13 stars denotes the unity of purpose as exemplified by the thirteen original states. The laurel leaf has, since early civilization, symbolized academic honors, distinction and fame. 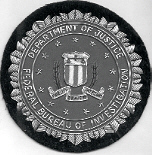 There are exactly 46 leaves in the two branches, since there were 46 states in the Union when the FBI was founded in 1908. The significance of the red and white parallel stripes lies in their colors. Red traditionally stands for courage, valor and strength, while white conveys cleanliness, light, truth and peace. As in the American Flag, the red bars exceed the white by one. 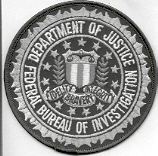 The motto, “Fidelity, Bravery, Integrity”, succinctly describes the motivating force behind the men and women of the FBI. 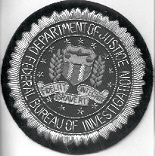 The peaked beveled edge which circumscribes the seal symbolizes the severe challenges confronting the FBI and the ruggedness of the organization. The gold color in the seal symbolizes its overall value. Notes: One version has a cloth backing and originates from the Houston Field Office. The second version was made by Vicki White Enterprises and was used in multiple offices. Three newer versions that were made by Gman Emblem. 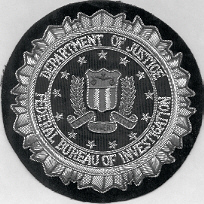 Notes: This version has gray and yellow edges around the seal. There are nine total variations that have different thicknesses in the coloring of the edges and/or differences in lettering. One version is eight inches in diameter. 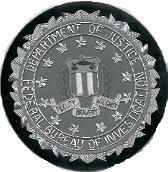 Notes: Subdued version of the seal used by the Tampa Field Office SWAT Team. One version has a cloth backing and the other version has a velcro backing. Notes: Several blue versions. One has a different colored border than the others. Another is lighter than the others and was made by Vicki White Enterprises. There is also a black version also made by Vicki White Enterprises. Two others with various minor differences. One blue version is smaller than the others at 2 3/4" diameter. Notes: One variation is 3.5" in diameter and the other is 3.75" in diameter. Notes: Two variations have white borders and the other has a blue border. The white border versions differ due to variations in letter thickness and mylar color. Notes: Version 1 has a blue border and blue background. Version 2 has a blue border and black background. Version 3 has a lighter blue border and black background. Version 4 is eight inches in diameter. Other four variations are due to color and size variations. Notes: Color Variations: Full color; black; blue; green; purple; tan. All variations made by Kokopelli Traders. Notes: All variations are due to slight differences in color or the design of the laurel leaves in the seal. Notes: Variation is due to slight differences in color. Notes: Version 1 is 3.75" in diameter and Version 2 is 3.25" in diameter. All variations have lettering in the scroll. Notes: Variations are due to slight differences in color. All variations have lines in the scroll. Notes: Variations are due to slight differences in color. All variations have blank scrolls. One version is made by Vicki White Enterprises. Notes: Variation is larger and has gray and gold edging. Notes: Used by Miami Field Office. Has small gray lettering in the scroll. Was made by Dan Meany, but he did not use stickers at the time. Notes: Used by Detroit Field Office. Has large black lettering in the scroll. Was made by Dan Meany, but he did not use stickers at the time. Second version also has no manufacturer markings and has darker stars than the first version. Third version was made by Gman Emblem and is a prototype. 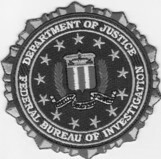 Notes: Used by Miami Field Office. Has large gray lettering in the scroll. Two variations were made by Dan Meany. On one version, he did not use stickers at the time. On the second version, his sticker for Mean Streets is on the back. The third version I have is a sample made for Gman Emblem and has their sticker on the back. The fourth version has no manufacturer markings and has darker blue stars than the others. 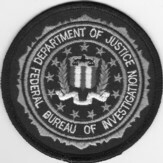 Notes: Used by Miami Field Office. Has small green lettering in the scroll. One version was made by Dan Meany, but he did not use stickers at the time. 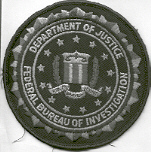 The second version was made by Gman Emblem. Notes: Used by Detroit Field Office. Has small green lettering in the scroll. Was made by Dan Meany, but he did not use stickers at the time. 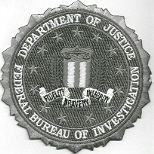 Notes: Used by Miami Field Office. Has large green lettering in the scroll. Was made by Dan Meany, but he did not use stickers at the time. 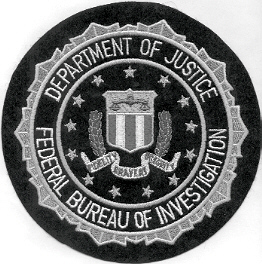 Notes: Used by Miami Field Office. Was made by Dan Meany, but he did not use stickers at the time. Notes: Eight full-color variations. Two are same color but one has a plastic backing and the other has a velcro backing. The third full-color variation is darker than the other two. The fourth full-color variation has mylar threading. The fifth full-color version has a black background instead of blue. The sixth full-color version has a red background with a blue line in the edging and is a prototype. The seventh full-color version has a red background and line around the edging. The eighth has darker edges than the others. There are eight subdued variations: two black variations with plastic backing and one has a matching velcro backed version, several green variations with different accent colors in plastic and velcro backings, bronze, and two brown variations with slight differences. All variations made by Gman Emblem. Notes: Made of metal and used on presentation plaques. Notes: Six color variations: Full color; black; blue; green; purple; and tan. All variations made by Kokopelli Traders. Notes: Originates from Los Angeles Office. Notes: Black subdued and Green Subdued variations. Both have velcro backings. Notes: One is 11" and the other is 7" in diameter. Made by David Nuernberg. Notes: Variations in lines around scroll. Notes: Two variations are different sizes and have the felt backing still attached. Notes: Variations involve the change in background color. Notes: 3" in diameter. Slight differences. 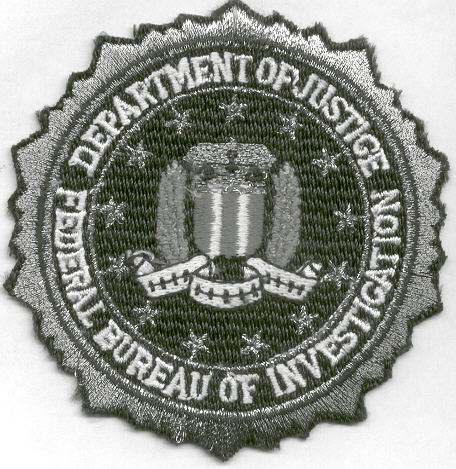 Notes: Parody patch of actual FBI Seal. Notes: Color and Subdued. Made by Huntzman Enterprises. Notes: Color variations. Made of PVC. Velcro Backed. Notes: Full Color. Velcro Backed.